Which country has already suffered the greatest losses through the new U.S. strategy announced a year-and-a-half ago by President Donald Trump? Clearly not Russia, whose relations with Washington were far from perfect even under the previous U.S. administration. Nor is it Mexico or Canada: even Trump is unable to turn the tables on the United States’ relations with its closest neighbours so rapidly and radically. With the exception of Iran, Syria, Cuba and the other habitual targets of U.S. attacks, Germany and China have the most reason to be unhappy with the current U.S. policy. Trump has been applying particularly strong pressure on Berlin and Beijing; the two countries’ current and, more importantly, potential losses from America’s protectionist stance far exceed the losses of all the other US trading partners combined. In addition, Washington has a serious political axe to grind with Germany and China. Berlin is being chided for its “insufficient contribution” to the NATO budget and its unswerving commitment to the Nord Stream II gas pipeline, whereas Beijing is suspected of “hegemonic aspirations” in the Asia-Pacific and of its attempted “expansion” into the Indian Ocean. If talking common sense, Chancellor Merkel and President Xi would be better off keeping closer to each other: they stand a better chance of weathering the pressure from the United States as a united front than on their own. Given the two countries’ impressive combined potential, the transcontinental Berlin–Beijing axis could become a worthy strategic response to the unprecedentedly strong and brutal U.S. pressure, even more so if this alliance secures the support of several other major countries between the Brandenburg Gate and Tiananmen Square. Including Moscow, which has its own agenda. How likely is such a new alliance to emerge in the foreseeable future? What are the potential opportunities and limitations of a rapprochement between Germany and China? What consequences would increased cooperation between the two countries have for Russia? The answers to these questions are critical not only to the future of the Eurasian space, but also to the fate of the new world order as a whole. The Berlin–Beijing axis first manifested itself as a possibility immediately after the new president took office in the United States. Trump’s electoral victory raised serious concerns in China, and came as a true shock to the German political establishment. Symptomatically, on the eve of the G20 summit in Hamburg in July 2017, Trump paid a demonstrative visit to Warsaw at the precise moment that Germany–Poland relations were experiencing yet another dip. Coincidentally or not, Merkel was rolling out the red carpet for Xi Jinping in Berlin. Six months prior to that, China had been announced as Germany’s largest trading partner for 2016 for the first time in history. Beijing’s interest in Berlin is not confined to China’s desire to further expand bilateral trade, boost investment and secure access to the latest German technology. With the new U.S. administration in power, the Chinese government is looking for ways to demonstrate its increased concern for the global problems Germany worries about, from climate change and WTO reforms to assistance to African countries. The Chinese leadership’s traditional statements as to the importance of free trade, the dangers of protectionism, the advantages of multilateral approaches and the need to adhere to the common rules of the game (Xi Jinping’s keynote address in Davos, Switzerland in January 2017 is one example) are primarily intended for Berlin’s ears. It is hardly surprising that in the emerging romance between China and Germany, Beijing plays the role of the decisive and persistent young man, whereas Berlin is the wary and calculating girl eager to gain the most from the potential relationship. To begin with, China is much stronger than Germany in terms of its economic and demographic potential, geopolitical position and military might. China is a permanent member of the UN Security Council, and also possesses nuclear arms. In other words, China is a full-blown major power, whereas Germany right now is not. Therefore, any relationship between the two countries will inevitably be asymmetric, with the balance tipped in China’s favour, and this asymmetry will need to be compensated for in one way or another. Second, China has greater room for manoeuvre in the international political arena than Germany. Currently, the country is not a party to any rigid politico-military or economic blocs; BRICS and the Shanghai Cooperation Organisation, these amorphous and barely binding associations, are beside the point here. Germany, for its part, has numerous fairly tangible obligations within NATO and the European Union. Berlin may be the driver of the European Union, but within NATO it often finds itself playing supporting roles. To continue with the romantic parallels, China the young man is single and free, whereas the girl is bound by close ties with numerous and often quite demanding European relatives, and is unwilling to sacrifice these ties under any circumstances. Whether the existence of “relatives” gives Germany extra bargaining chips in its contacts with China or actually weakens its position is a moot question, but the significance of this factor should not be underestimated. Third, potential rapprochement is being hindered by the fundamental differences in values. It is difficult to build a strong relationship of trust if one of the partners has a conservative religious background and the other is an inveterate atheist. Germany today is perhaps the leading vector of traditional liberal values, not just in Europe but in the whole world. China’s political model of authoritarian modernization, for its part, is the exact opposite of Western liberalism. Predictions to the effect that the emergence of a middle class in China would inevitably result in the country drifting towards Western-style pluralistic democracy have so far been proven wrong. If anything, China appears to be drifting in the opposite direction. Fourth, the Berlin Fräulein already has a young man, one that has for decades remained her key partner, protector and, to a great extent, an indisputable authority and guru. That young man lives in Washington. Germany and the United States have had their share of misunderstandings and even quarrels over the years; suffice it to recall Berlin’s resolute opposition to the U.S. intervention in Iraq back in 2003. Yet, until very recently, very few in Germany could picture their country’s future outside the close military, political and economic alliance with the United States. Remove that support, and the entire structure of Germany’s foreign policy would collapse in no time. This last argument needs to be addressed in greater detail. It would be fair to say that in all of its long and sometimes dramatic post-World War II history, Berlin has never been exposed to attacks, threats, blatant pressure and even blackmail on the part of Washington on a scale similar to what has been going on in the past 18 months. Never before have the views of the leaders of the two countries been so far apart and the level of mutual trust so low. One could, of course, argue that Trump will eventually go and the American people will remain. However, it was these same American people that elected Trump as their president in the first place in November 2016, albeit not unanimously. In fact, Trump’s popularity in America appears to be growing rather than declining. Whatever the case, it is obvious that Berlin will continue to suffer from the political and psychological consequences of the current transatlantic relations crisis long after the current president leaves the White House. The bilateral relations are not going to return to what they were during the times of the Obama administration any time soon, despite the hopes of German politicians and intellectuals with their orthodox Atlantic world view. As we can see, China is to play the leading role in the emerging rapprochement. How can Beijing possibly dispel Berlin’s doubts as to the purity of its intentions? What price would the Chinese leadership have to pay for this? Let us take a closer look at Berlin’s main fears. First, Berlin is extremely uncomfortable with Chinese investors methodically buying German businesses that specialize in the most promising sectors of technological development. Germany suspects that China is driven by more than just commercial interests; that it is, in fact, pursuing a national strategy aimed at gaining a technological advantage over the West in general and Germany in particular by the end of next decade. China invested nearly $14 billion in Germany in 2017, or almost two-thirds of its total investments in Europe. Germany became aware of the potential threat. In 2018, Berlin partially nationalized one of the country’s largest power grid operators in order to prevent Chinese investors from buying into it. Preventive measures were also taken with regard to a major German hi-tech machine-tool specialist company that resulted in a potential Chinese buyer being forced to abandon its plans. These steps evidently contradict the general principles of Germany’ foreign trade policy, and would have been impossible just a few years ago (Russia’s Sberbank did fail to buy Opel at some point in the past, but then the deal fell through due to the position of General Motors, the U.S. owner of the German car maker). What could China do in this respect? The most logical solution would be to provide for maximum possible reciprocity by granting German investors unhindered access to the hi-tech sector of the Chinese economy. This remains a problematic topic: China’s hi-tech sector is still largely impenetrable to foreigners. Greater transparency of business practices and a consistent fight against corruption would also raise Germany’s trust in Chinese investors. Beijing is sure to find these steps to be quite difficult and even risky, but a serious relationship with Berlin is bound to come at a price. Second, Germany is concerned about the possibility of the balance of its trade with China changing dramatically in the coming years. Unlike the United States, Germany currently enjoys a significant surplus in trade with Beijing: exports stood at $96 billion in 2017, and imports amounted to $71 billion. Some fear, however, that the recently unleashed trade war between the United States and China may prompt Beijing to switch a significant portion of its exports to Europe, including Germany, which has the most capacious market in Europe. As a result, Germany could not just lose its current surplus, but would eventually find itself in a situation similar to that in which the United States currently finds itself. These fears are justified: sooner or later, Beijing will ask Berlin to balance out bilateral trade. It would of course be a grave mistake to do so in the style of Trump, i.e., by twisting Germany’s arm. Quite on the contrary, the Chinese leadership has a great opportunity to demonstrate how different its balancing-out methods are from those used by the United States. Furthermore, if the full-scale U.S.–China trade war eventually breaks out, Beijing could invite Germany to replace the United States as an exporter to the Chinese market. Germany already exports about twice as many cars to China as the United States, but U.S. exports are still significant at about 10 per cent of the market. China could discuss this opportunity with its German partners. Third, Germany is rightly irritated by Beijing’s activity in Berlin’s “backyard” – that is, in Central and Eastern Europe and the Balkans. One particular irritant for Berlin is the 16+1 cooperation mechanism created by China for these countries, which involves regular meetings at the highest level. This format is perceived in Germany as China attempting to undermine European unity and gain backdoor access to the European Union. First, because the format involves 11 EU member states alongside five non-aligned countries of the Western Balkans. Second, because the 16+1 mechanism gets to discuss, among other things, issues pertaining to the EU remit (infrastructure development, e-commerce, etc.). An additional vexing point for Berlin was the fact that the latest 16+1 summit took place just several days before the July 2018 EU–China summit. One could, of course, dismiss Germany’s suspicions and fears as being unreasonable and even hypocritical. After all, Germany consistently opposes any “privileged interests” in Europe and promotes all countries’ sovereign right to choose their partners and cooperation formats. Should Beijing resort to such rhetoric, it would doubtlessly earn a standing applause from Moscow. It is, however, hardly in China’s best strategic interest to ignore Germany’s fears, no matter how unfounded: Berlin is more important to Beijing as a potential strategic partner than all of Central Europe and the Balkans. So, if the road to Berlin lies through Brussels, then Beijing will take it. Beijing has already made token concessions to the European Union: in future, 16+1 summits will be held once every two years and not annually as before. The Chinese leadership has been consistent in stating unequivocally that Beijing is interested in a unified European Union. Beijing has been careful not to support Eurosceptics, populists, right-wing radicals and other marginal forces within the European Union. 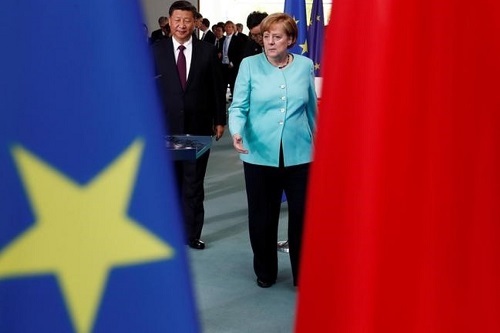 Yet China could do even better, such as offering Berlin a joint China–Europe development programme for the Western Balkans in order to refute any suspicions about a possible hidden agenda on the part of China that is aimed at “infiltrating” this very important European region. Fourth, in assessing the advantages and disadvantages of closer cooperation with Beijing, Berlin naturally wonders how this rapprochement would affect its relations with other Asian partners: Japan, India, the ASEAN countries, Australia, New Zealand, etc. It would certainly be extremely short-sighted of Germany to sacrifice these relations or even give its historic Asian friends a reason to doubt its strategic political priorities. It is, therefore, in Beijing’s best interests to promote the potential Sino-German axis not as a stand-alone bilateral geo-economic project, let alone a geopolitical one, but rather as an important component of a broader multilateral plan aimed at creating a single Eurasian economic space. The implementation of this plan should prompt individual Asian countries to gradually forget about their bilateral disagreements in the face of the common long-term development targets. It would be too foolhardy of Beijing to seek Berlin’s direct support for its stance on the territorial disputes in the South China Sea, or to prompt Germany to side with China in its conflict with India. Fifth, the most difficult obstacle to closer cooperation between China and Germany is the current gulf between Germany’s liberal political system and China’s authoritarian one. No sane politician in Berlin can possibly overlook the human rights violations in China, neglect the fate of Chinese dissidents, turn a blind eye to the discrimination against ethnic and religious minorities, ignore the existing restrictions on the dissemination of information and many other manifestations of Chinese authoritarianism. These values have always been and will continue to be a bone of contention in bilateral relations. However, just because a fundamental solution of the values problem cannot be reached does not mean no progress is possible in this respect. China’s symbolic concessions with regard to individual dissidents are absolutely important (in the latest such development, Liu Xia, the widow of Nobel laureate Liu Xiaobo, was permitted to travel to Germany). It appears to be of even greater import, however, for the two countries to develop contacts along the lines of civil society, education, culture, youth and women’s organizations. For this to happen, China needs to turn Germany into a “fashion,” so as to change the Chinese public’s perception of the West as being primarily associated with the United States. Why is Trump Not Afraid? Even the remote and purely hypothetical possibility of a China–Germany alliance should be the cause of great concern for any serious politician in Washington. There is hardly any other geo-economic combination on the planet capable of posing such a threat to the United States, this key economic, financial, scientific and technological centre of the modern world. History teaches us that a war against two strong adversaries at once can rarely be won. A China–Germany alliance, even a short-lived one, should appear particularly threatening to the current U.S. administration, which is in the habit of assessing international challenges primarily from the standpoint of America’s short-term economic interests. Is Trump afraid of a trade and economic war on two fronts? He appears not to be. If he were afraid, he would be behaving somewhat differently. At the very least, he would be more tactful and understanding with regard to one of his oldest and most reliable European allies. So far, however, quite the opposite is true. It seems at times that the President of the United States is actually pushing the German bride into the embraces of the Chinese groom. Such shocking behaviour needs some rational explaining. Some of Trump’s political opponents tend to explain the President’s behaviour as manifestations of his personality quirks. In their opinion, he is simply unable to keep a comprehensive picture of the world in his mind, nor does he want to think strategically. Therefore, the reasoning goes, Trump views the United States’ relations with Germany and China as separate and unrelated prongs of America’s foreign policy. He does not give a though to the possible consequences for the Germany–China relations of America’s growing pressure on Beijing and Berlin. Another explanation of the Trump administration’s policy can be described as “the presumption to power of the United States”: the White House is closely monitoring the progress of the attempted Germany–China rapprochement, but does not believe that it will succeed. The United States’ relations with both Germany and China remain asymmetric: the latter two are more dependent on the United States than the other way around. The White House may be under the impression that even if Berlin and Beijing unite efforts, they will still be unable to create a global financial, economic and technological centre that would be independent from Washington. Furthermore, neither China nor Germany has dared so far to resort to symmetric measures in response to the latest bouts of U.S. economic pressure. Therefore, the White House has no cause for concern, at least not in the foreseeable future. The third and, in our opinion, most convincing explanation is that the Trump administration is simply incapable of imagining that German politicians are prepared to revise their views on the world, and of Germany’s desirable place in that world. U.S. political circles have long grown used to the periodic outbursts of anti-American sentiment in Germany; these outbursts are not perceived as posing any serious threat to the U.S.–Germany alliance for as long as they do not affect the German political establishment. This was the case during the German anti-war movement in the late 1970s and the early 1980s and during George W. Bush’s presidency. History may yet repeat itself under Trump, too. One thing is obvious, however: Trump is applying much greater pressure on Germany than his Republican predecessors. The United States is making a show of demeaning not just the current German leadership, but the German political class as a whole, precisely when marginal German nationalism is beginning to awaken from its protracted slumber (as evidenced by the success of the Alternative for Germany party in the latest election). The combination of the imminent systemic crisis in Germany’s domestic politics and the loss of reliable international support in the form of the transatlantic partnership could create the prerequisites for an “ideal storm” in German politics with most unpredictable consequences. The cockiness with which the current American leadership is treating Germany may eventually result in something similar to what Moscow got in exchange for its arrogance towards Berlin. Such a comparison might be farfetched, but we believe that it merits attention. Russia had long believed that its “special relationship” with Germany would remain no matter what. Moscow was banking on the Germans’ “historical guilt” over the country’s role in World War II, and expected Berlin to never forget the role Russia had played in Germany’s unification. There were hopes for the rapid development of bilateral trade and economic cooperation, including with Germany’s leading major businesses. Busy with all these calculations and hopes, Moscow overlooked the moment when it lost its erstwhile status as Berlin’s “privileged partner”; Germany stopped being an unconditional lobbyist for Russia’s interests in the Euro-Atlantic community. Moscow equally overlooked the moment of the generational change in German politics, with a new generation of leaders emerging in the political arena for whom the World War II and even the unification of Germany were nothing more than mere episodes in the country’s centuries of dramatic history. It would of course be oversimplifying things to draw direct parallels between Germany’s Ostpolitik, which has long disappeared, and its modern, still fairly viable Atlanticism. Fidelity to Atlantic unity has always run much deeper in German society than its adherence to “Eastern politics” and Berlin’s willingness to maintain the “special relationship” with Moscow. Still, the Trump administration could benefit from looking at Russia’s experience, which is something that it is obviously not doing. Therefore, even without China factored in, it is obvious that the risks for the transatlantic partnership continue to grow. An Axis or a Triangle? Unfortunately, Russia does not appear to be in a position to play a leading part in the new game that is beginning to unravel in Eurasia. Its economic potential is too limited, and its positions in the emerging Eurasian interdependence system are too weak. On the other hand, Russia cannot afford to stay on the outside, since its future will largely depend on the outcome of the emerging confrontation of the Unites States with Germany and China. The successful development of cooperation between Germany and China would be beneficial to Moscow, if only because it would deprive Washington of its current monopoly to determining the fundamental rules of the game in the global economy. There is very little hope that relations between Washington and Moscow will improve any time soon; for as long as the United States gets to dictate the rules, Russia will be consistently ousted to the periphery of the world economy. There is also the constant threat of extraterritorial U.S. sanctions, as illustrated by Iran. In the meantime, China and Germany are Moscow’s main trade partners and are likely to retain this status for a long time. In fact, economic ties with Beijing and Berlin remain complementary for Russia: the countries are Moscow’s main points of entry into the global economy. It would, therefore, be entirely logical for Russia to feel enthusiastic about the possibility of taking part in the creation of the Berlin–Beijing axis and attempting to turn it into an equilateral triangle. It should be noted that Russia has no interest whatsoever in the destruction of the present liberal world economic order, whose protection is to serve as the foundation of the China–Germany rapprochement. This, despite the fact that the term “liberalism” has recently acquired strong negative connotations within Russia. Just like any other participant in the international economic system, Moscow may have its problems with some aspects of this world order. However, excessive protectionism, the abandonment of multilateralism, the decline of universal international economic organizations and the world splitting into opposing trade blocs would do nothing to help Russia integrate into the global economy; nor will they facilitate the country’s economic modernization. The opportunity to integrate into the China–Germany cooperation processes would provide Moscow with additional room for manoeuvre, enabling it to offset the “turn to the East” by a re-activation of contacts with the West. In the long run, the China–Germany axis could turn into one of the pillars of the “Greater Eurasia” concept, which has been actively discussed in Moscow of late. However, a rapprochement between Germany and China per se would not automatically generate new opportunities for Russia. Beijing may well stick to its long-standing practice of pursuing parallel political courses in its relations with Moscow and Berlin. Germany in the current situation would certainly prefer to develop cooperation with China without involving Russia, which has only been creating problems for Berlin – at the very least until the Ukrainian crisis has been truly resolved. It is, therefore, extremely important for Moscow to not become the odd man out in the China–Germany alliance, and to contribute its unique advantages to the axis. These advantages should certainly go beyond Russia’s geographical situation: there are plenty of transit options between China and Germany, not all of them passing through Russian territory. Moscow should, therefore, look for different kinds of opportunities, such as tripartite development projects for the Balkans, Central Asia and Afghanistan. Other opportunities could include initiatives that would marry security to development, such as migration management, the prevention of political radicalism and addressing the challenges associated with new technologies. In any eventuality, Russia’s value for both Germany and China will be largely defined by its ability to shift from the current inertial economic model to an innovative one. In addition, as was already mentioned, no separate Russian or Chinese policy with regard to Germany can exist out of the broader EU context. Neither the United States, nor China, nor Russia will replace the European Union at the centre of Germany’s universe. Therefore, Moscow cannot expect to be on good terms with Germany while simultaneously being on bad terms with the European Union. Just like with China, the road to Berlin for Russia inevitably runs through Brussels. So, this road needs to be taken, no matter how long, winding and difficult it may turn out to be. There may be different opinions about the chances the potential China–Germany alliance has to succeed. It is possible that an alternative geo-economic structure will emerge instead, such as a Berlin–Tokyo axis or a close partnership between the European Union and India. It appears indisputable, however, that the major actors in the global political arena are now required to make major, non-orthodox and perhaps even paradoxical decisions. So far, most of these actors have been biding their time, hedging emerging political risks, carefully calculating the balances of group interests, maintaining the status quo and hoping that the situation would somehow rectify itself, solely on the strength of their having chosen “the right side of the barricades.” This is perhaps how Roman aristocrats behaved towards the end of the Empire. Trump is not one of them. He is often rightly accused of being unprofessional, impulsive, lacking in strategic vision and of many other sins. That said, he is actually trying to solve the United States’ global problems rather than postponing them until the next term in office or not passing them on to the next generations. In other words, Trump is a man of action, a trait rarely to be found in the contemporary world. For this reason, until other leaders in Europe and Asia begin to demonstrate a similar capacity, Trump will always have, at the very least, an important tactical advantage over his opponents. Director General of the Russian International Affairs Council (RIAC). Andrey Kortunov graduated from the Moscow State Institute of International Relations (MGIMO) in 1979 and completed his postgraduate studies at the Institute for U.S. and Canada Studies of the USSR Academy of Sciences in 1982. He holds a PhD in History. Dr Kortunov completed internships at the Soviet embassies in London and Washington, and at the Permanent Delegation of the USSR to the UN. In 1982–1995, Dr Kortunov held various positions in the Institute for U.S. and Canada Studies, including Deputy Director. He taught at universities around the world, including the University of California, Berkeley. In addition, he led several public organizations involved in higher education, social sciences and social development, such as the Moscow Public Science Foundation (1993–2001); the Information, Scholarship, Education Center (2002–2017); and the New Eurasia Foundation, (2004–2017). Dr Kortunov has been the President of the New Development Technologies Autonomous Non-profit Organization since 2015. 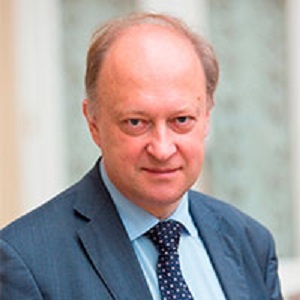 Since 2011, Andrey Kortunov has been the Director General of RIAC. He is a member of expert and supervisory committees and boards of trustees of several Russian and international organizations. His academic interests include contemporary international relations and Russian foreign policy.